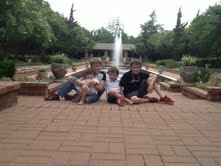 In the Summer, my boys and I like to take a drive to Clark Gardens in Mineral Wells. Have you been there? Well, it's time you went! Not too far from Fort Worth, but just far enough to feel like an adventure, it's an easy day trip with kids. We try to start out early to beat the summer heat, but, trust me, we've never gotten there when they open at 7:00 a.m. It's a pretty straight shot from Weatherford on US 180, but I can't resist taking I20 to 281. It's a little out of the way, but totally worth it to see the hilly terrain and Brazos River. When you turn on to Maddux Road a little East of Mineral Wells, you'll wonder why you bothered making the trip. Scrubby cactus and mesquite line the drive. But trust us and go on in; we promise you'll be surprised. Owners Max and Billie Clark started landscaping their yard for their daughter's wedding years ago, and just kept on going. And going. And going. I've told you about my gardening abilities- or lack thereof - before, and how a mesquite patch could be transformed into something this lush and beautiful is just too much for my little flower-killing self to imagine. We like to start off through a series of lily ponds and butterfly islands. My boys keep their eyes out for frogs and turtles perched on the lily pads, and, this year, the gate attendant gave us something new to watch for: Big Bertha. Apparently, a huge water snake has lived around one of the waterfalls for years and we never knew it. We searched high and low, only to find out she was spotted on the other end of the park that day. You could take that as a big loss or big win, depending on your opinion of snakes. Next, feeding the ducks and goldfish keep the boys busy while we relax under the ceiling fans of one of many pavilions around the gardens. We make the boys pose sweetly for a few more pictures than they would like. Then head off to their favorite part of all: the Train Station. And what a train station it is. Inside, trains pull into models of old Mineral Wells and Weatherford. Outside, they chug past each other through miniature farms, nearby towns, over bridges and across rivers. My boys are captivated, watching from every angle and always hoping to see a lizard or a squirrel on the tracks. When we're all finally satisfied at the train station, we mosey through the rest of the park. My boys call to the peacocks while we make our way through rose gardens and daylily beds. They put up with our interest in the Historic Tree Trail, and run through the shade to an overlook high above the valley. They tiptoe into the chapel and then sing at the top of their voices when they notice the booming echo and realize no one else is inside. We typically pack some snacks and drinks, and there are drinking fountains all through the park. Still, by lunch we are very hot and very hungry, and very happy to have seen the whole park one more time. We drive back in to Mineral Wells for barbecue at the Mesquite Pit, and then head home, exhausted. A house full of sleeping kiddos is the sign of a very good day trip! What fun little trips do you like to take with your family? Tell us about them!